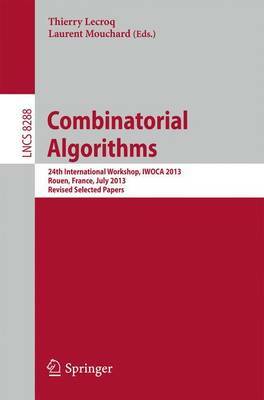 This book constitutes the thoroughly refereed post-workshop proceedings of the 24th International Workshop on Combinatorial Algorithms, IWOCA 2013, held in Rouen, France, in July 2013. The 33 revised full papers presented together with 10 short papers and 5 invited talks were carefully reviewed and selected from a total of 91 submissions. The papers are organized in topical sections on algorithms on graphs; algorithms on strings; discrete geometry and satisfiability.